Derived from naturally-occurring metamorphic rock, quartzite countertops make a beautiful statement when properly sealed, polished, and maintained. Offering vibrant white and grey hues, quartzite stone swims with movement and is among the most durable, heat-resistant countertop choices. Bringing the outdoors in, granite is a striking stone available in hundreds of color combinations, hailing from all corners of the globe. A family-friendly countertop choice with several finishing options, granite countertops are an enduring and elegant way to increase your kitchen’s wow-factor. Countertops crafted from concrete revolutionize the look and feel of your kitchen. A highly customizable option, concrete can be pigmented, dyed, textured, or left as is for a more industrial feel. If you want your modern concrete countertop to really shine, topical sealers like epoxy and urethane will produce a high-impact glossy finish. Other countertop options include marble, tile, wood, soapstone, and stainless steel. Whether you’re embarking on a full kitchen remodel or looking to make minor upgrades, the kitchen sink is a smart place to start. Among the most used items in your kitchen, the sink is an opportunity to offer your space both beauty and practicality. Depending on your lifestyle and aesthetic taste, there are a variety of sink styles to choose from. Seamless and sleek, undermount sinks are installed below your kitchen countertop. With no raised edge or lip, these sunken structures make cleaning debris a breeze. Offering a charming, custom feel, apron-front farmhouse sinks are a favorite focal point among fans of the rustic, old-fashioned look. Double Basin Sinks: Designed for multi-tasking, double basin sinks are popular among cooking connoisseurs as they offer separate spaces for rinsing and preparing without the need for sterilization. In terms of material for your kitchen sink, consider stainless steel, granite composite, enameled cast iron or fireclay. An experienced interior designer will inform you of options that best fit your budget. Great kitchens emphasize the beauty of details. If you’re looking for an easy way to increase the value of your home’s kitchen without spending your remodeling budget all at once, start by addressing your appliances. Upgrading to high-end appliances will make your kitchen feel more finished and expensive. An iconic name in cooking, Viking offers appliances in stainless steel and colored options including dishwashers, microwaves, ranges, refrigerators, and ventilation hoods. More affordable than its competitors, Thermador offers generous rebate packages and is a brand name that will pique the interest of anyone who sets foot in your kitchen. One of the most stylish names in kitchen appliances, German-engineered Gaggenau offers appliances for cooking, ventilation, refrigeration, baking, and even coffee. Additional names you may want to consider when upgrading your kitchen appliances include Miele, Sub-Zero, La Cornue, and Jenn-Air. A great deal of time, effort and sometimes money will go into any kitchen upgrade or remodel. Opportunities to add value to your kitchen are vast. 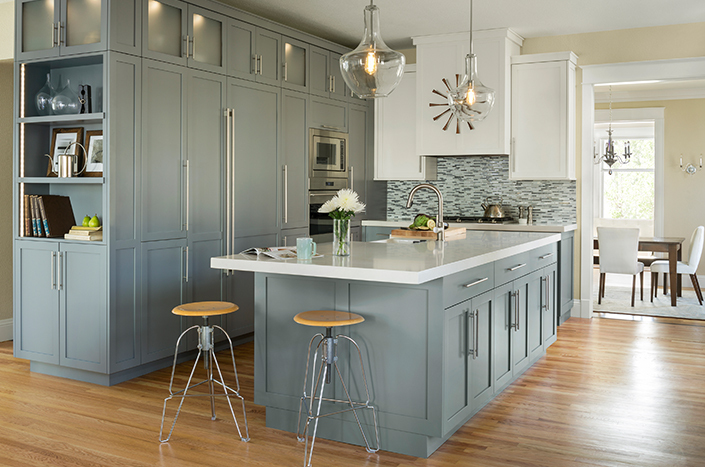 Kitchen upgrades that will increase the resale value of your home are usually bigger investments, but if you want to start small, try a fresh coat of paint or a modern window fixture and see where your imagination takes you! Contact Factor Today if you want to upgrade your kitchen!